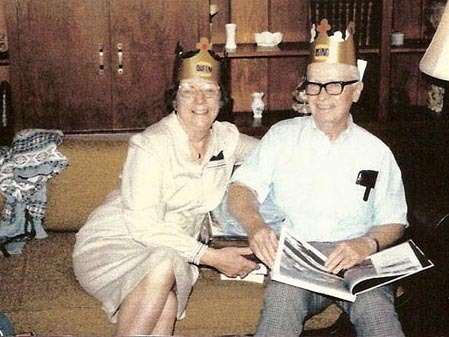 Y'know, back when my grandparents were living, we made the four-hour drive to Houston to visit them for all the big holidays. I have vivid memories of Game Boys and apple-juice boxes in the backseat, and waving to the big statue of Sam Houston as we passed, and a dog or two that always woke up and whined whenever we got off the freeway. It was only later, as a teenager, that I realized that what our family did was not universal - that lots of families couldn't enjoy each other's company at all - and only MUCH later, as an adult, that I realized that there were legitimate reasons for that - that some people just can not control their emotions or behavior, and are not safe to be around. So I will never question or criticize anyone who chooses not to visit their family. But y'all - this year, of all years, I am more grateful than ever that our parents went the extra mile to make sure we did not miss out on having grandparents. I am so, so glad that they made sure we spoke thoughtfulness as a first language. And for all you guys who are doing that same work this weekend - choosing your words carefully, focusing on the things you CAN do and discuss together, taking care to make the time enjoyable for everyone at the table - you have my deepest appreciation. We need you now, maybe more than ever before. And the values you're living right now will last longer and reach farther than you know.